“The Albuquerque Journal reports 1-year-old Maddie showed “strong positive cocaine” and active marijuana traces in urine tests conducted this week by an Albuquerque clinic. A clinic report says veterinarians saw the dog twitching, shaking and walking with poor balance after owner Arlene Saiz brought her in. The report says because Saiz couldn’t pay the vet bill, she signed the dog over to the city Animal Welfare Department. ‘Strong positive cocaine’? Who are these Veterinarians? Canine CSI? 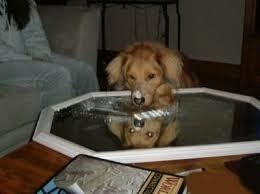 It is not routine to test for cocaine in a dog’s urine. I didn’t even know that a regular Veterinarian (not part of a police investigation) can request a test like this. And what about the owners? Were they informed about the nature of the test? “Mrs Smith, we will just get Fluffy’s urine and test it for Cocaine. Is that OK?” Can you picture that conversation? I can’t. Let me tell you, it’s not a test I have ever requested from the lab in my 12 years as a Veterinarian. Then again, we all want to play Secret Agents sometimes. I just not’t think think our clients would approve us playing it on their dogs.